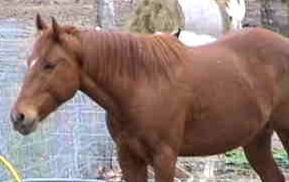 Here are our geldings you'll find lounging and roaming around our place. Ace has been with us since '01. He's been in a couple of parades and went to a show. He's mostly been used for leisurely riding, but he'd be good at barrels & team penning. His last owners said the only reason they were getting rid of him is because they owned a dairy farm, and he kept rounding the cows up and herding them into his stall. We haven't tried him on a cow yet, but we should...I'd like to see his reaction. He just may get to do these two things sometime in the near future.